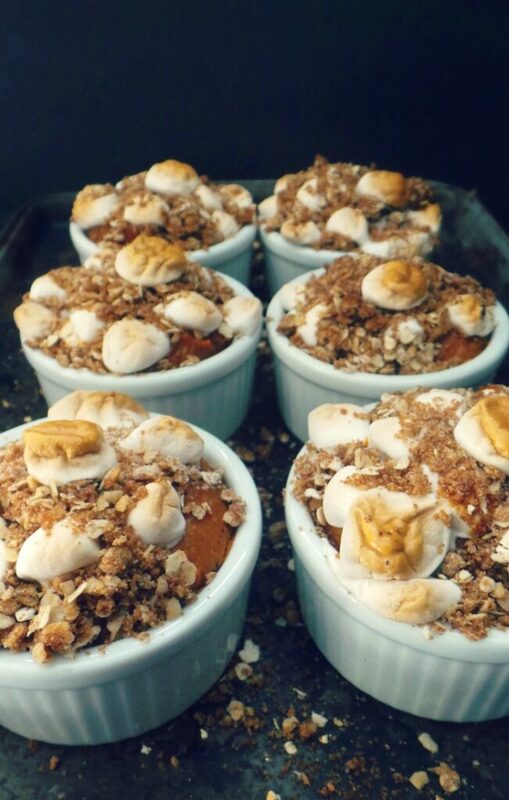 Real baked sweet potatoes, sweetened with molasses, topped with marshmallows and covered with a brown sugar streusel is like a party in every bite. It has been over a decade since I stepped foot into a Boston Market but the memory of their Sweet Potato Casserole has stayed with me as one of my absolute FAVORITE things on their menu. I had to find a way to bring it back to our holiday table! After a lot of tweaking and playing with the ingredients, I’ve come up with an amazing, Allergy-friendly & Vegan Sweet Potato Casserole. 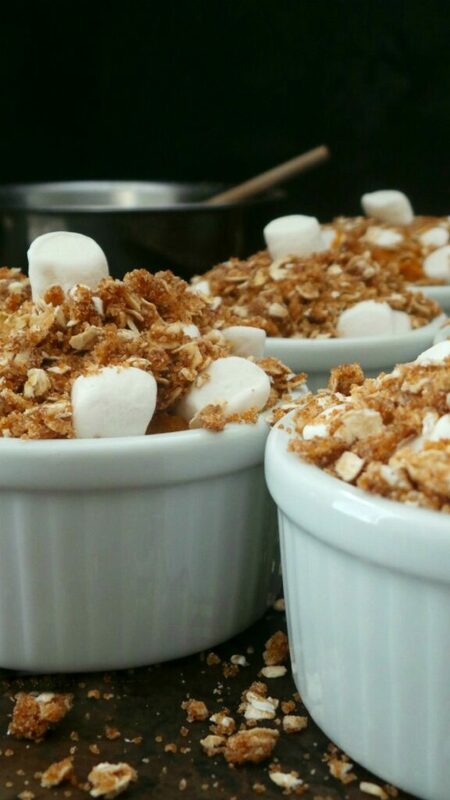 Typically, I make this in a large casserole dish for Thanksgiving, but I thought it would be fun to bake these in little ramekins so each person would have their own pretty little serving with the perfect amount of marshmallow streusel topping (because you know everyone scoops off the all of the top layer when served in a big dish). Using your baked or microwave cooked sweet potatoes, mash them then add your butter and processed until smooth. Add in your flax egg (or 2 eggs), salt, cinnamon, nutmeg and vanilla and process until smooth. If you have a high-powered blender, like a Blendtec, this will work great for this part of the recipe. In fact, my entire blending process was done in the blender. Add in your dark brown cane sugar and canned coconut milk blend until everything is uniform. If you use ramekins, an ice cream scoop will make the perfect serving size and will give you approximately 12 individual dishes. I used 1 1/2 scoops and got 8 servings out of it. Now add your topping. Hopefully you’ve already made the streusel mix while the sweet potatoes were cooking, but if not, I’ll wait. It’ll only take a couple of minutes. Combine together your flour (use GF Oat flour or GF All-purpose to keep this recipe Gluten-free), dark brown cane sugar, GF quick cooking oats, cinnamon and salt. Add in your softened butter and cut with a fork until crumbly. This mixture will be your top layer, over your marshmallows. Now here’s the hardest part….waiting 20 minutes for it to bake. I know, I hate to make you wait, but you’ve heard the saying “Good things come to those who wait”, right? This is definitely one of those “good things”. Keep in mind, if you choose to put it all together in a large casserole dish, you’ll need to increase your baking time to 30-45 minutes where as the smaller ramekins cook in about 18-24. Keep your eye on it as it nears the end so your topping doesn’t burn. Just nice and toasted and melty is what you want. I couldn’t quite wait for everyone, so I had to dig in! Another benefit of individual cups. 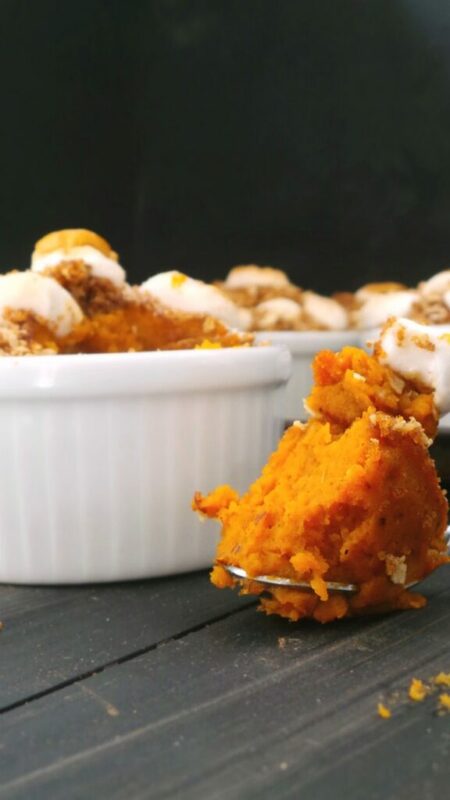 Velvety, warm sweet potatoes, sweetened & spiced then baked with an oatmeal cookie-like topping……YUM! You know another recipe that is yummy, these Paleo Sweet Potato Waffles from Perry’s Plate. This would be a delicious way to start your morning before you indulge in this casserole during dinner. 2 treats in 1 day! Impress your friends this holiday with a Baked sweet potato casserole, sweetened & spiced then topped with marshmallows and a streusel crust. Wrap sweet potatoes in foil and place on a lined baking sheet. Bake 1 hour or until soft when pierced by a fork. OR pierce with a fork and cook in the microwave 6-8 minutes, until soft. Remove skins from cooled, cooked sweet potatoes. Add potato to a medium sized bowl with your banana then mash together in a bowl. Transfer to a high power blender . Add 3 TB. butter, flax egg mixture, salt, cinnamon, nutmeg and vanilla. Blend until uniform. Add brown sugar and canned coconut milk. Puree until smooth. Combine in a medium bowl, flour, dark brown sugar, oats, cinnamon and salt. Stir the dry ingredients together. Add softened butter and cut into flour blend until crumbly mixture is formed. 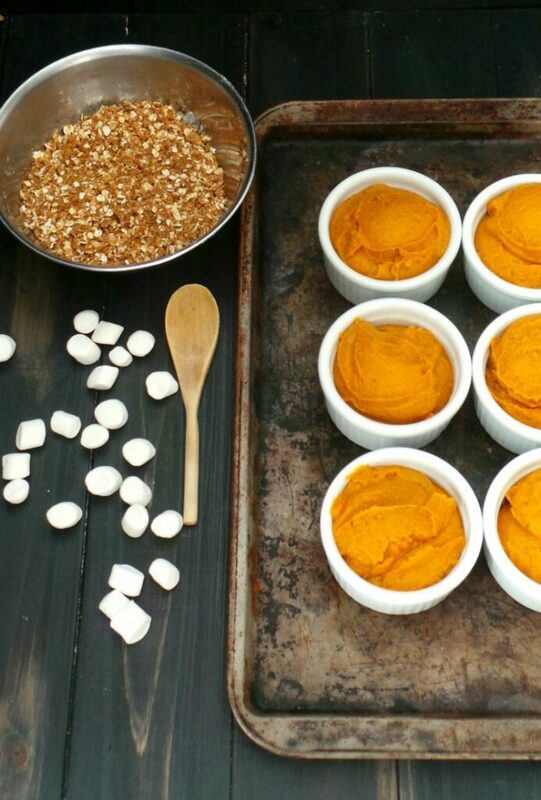 Assemble casserole by scooping 1 Large, ice cream scoop size of sweet potato puree into ramekins. Top with 1/4 C. marshmallows. Press down slightly then pace Streusel topping on top of marshmallows. Bake at 350° for 18-24 minutes or until marshmallows are melted and crust is a light golden brown. 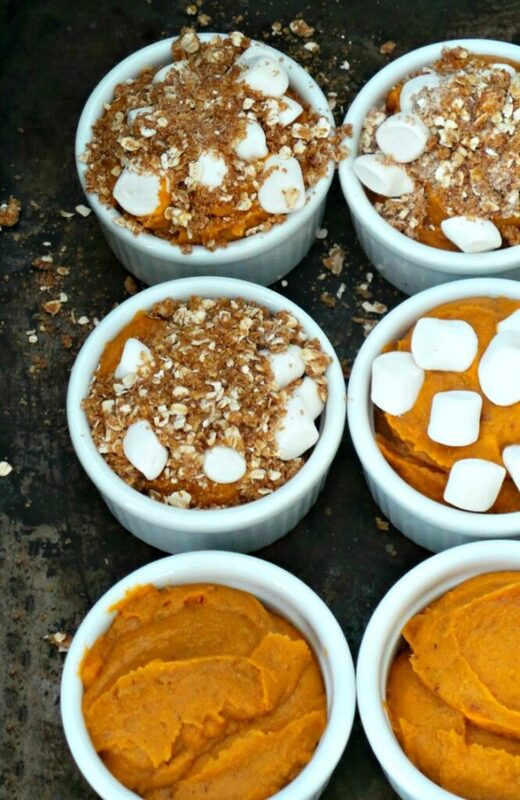 Such a great idea serving this tasty sweet potato casserole in little individual ramekins! Love! It does help with portion control…which I desperately need when this casserole is around. These look so scrumptious!! I think I’d even make the individuals and save one for breakfast! I think that’s an awesome idea Sarah. I am loving how easy you make this recipe look to make….that topping is perfect! You MUST try it, however, 1 year I made the mistake of omitting mashed potatoes since we had sweet potatoes & I’ll never do that again. I’m all about those single-serve portions. And banana with sweet potato? Genius! Single serve is a fun way to go & great for portion control too (if you need it on Thanksgiving)!